For me this beautiful shirt is one of the best Scotland jerseys of all time and was a massive departure from the designs that preceded it. The shirt appeared on the cusp of the retro football influence that transformed a purely modernist approach to football fashion that occurred throughout the '80s. This Scotland shirt was first worn in May 1988 in a home international match against England and introduced an era of button down collars accompanied by a placket or opening in the neck. Button-down collars were to find their way on to virtually every Umbro shirt over the next three or four years and were rapidly copied by many other smaller sportswear brands at the time. The placket on this shirt was unique however, in that it was VERY long and really brought to mind the old-fashioned shirts of the '40s and '50s. Plus, in a real stylistic triumph, it featured a subtle tartan design, the first time this most famous icons of Scottish visual identity had been included in a football kit. 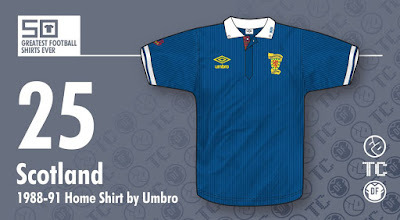 The tartan itself was a unique blend, specially designed for the Scottish Football Association. It was a brave move and perhaps one only made possible by the seismic shift in kit design thinking that occurred at the end of the '80s. The rest of the shirt was full of delicate design elements that all contributed to making it a real classic. It was more generously cut than the previous Scottish jersey, therefore making it more appealing to replica-wearing Tartan Army foot soldiers and the fabric featured a subtle shadow pinstripe that added real class to the entire ensemble. Finally, two small Scottish Football Association icons were added, a Gothic monogram on the collar and a more complex design on the right sleeve. Another aspect that is often ignored with this shirt, but one that I believe helps transcend it above the ordinary, was the inclusion of a yellow Umbro logo rather than the more familiar and predictable white version which complemented perfectly the new SFA crest. The new crest was sophisticated and flamboyant and replaced the albeit popular but rather bulky roundel badge that had been favoured for the past 20+ years. All of these elements, small as they may be, were clearly highly considered by the Umbro team and really ushered in a new era of kit design.